Pruning was the main work of deep winter on the prune farm. My Dad really enjoyed this part of the job. Winter days darkened in late afternoon, giving him an excuse to quit early and settle down in the living room. I’d find him there, reading, when the bus arrived home from school about 4 p.m. 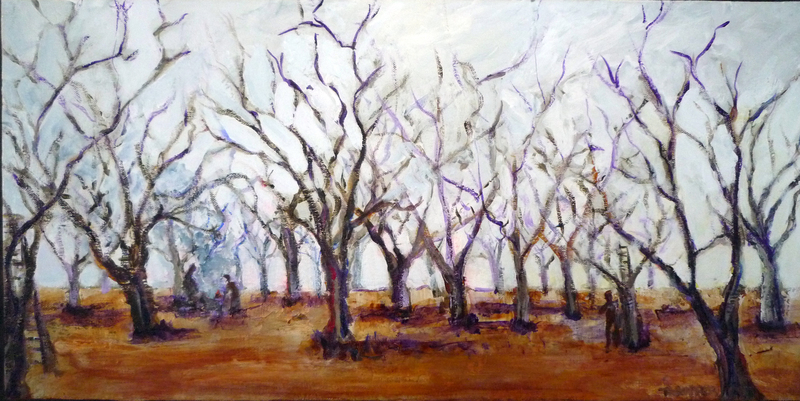 I hope the painting Winter’s Work captures the cold, stark light of winter in the orchard and the lazy smoke rising from the burning brush.